The Desert Bus for Hope is rumbling through the desert like a non-stop juggernaut of awesome, smashing road signs and donation records with equal aplomb. 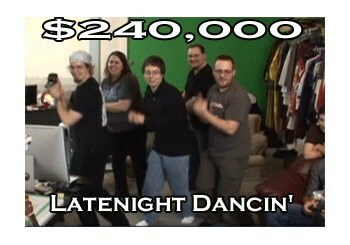 In 2007, also known as Desert Bus Year One, the LoadingReadyRun team raised nearly $23,000 for the Child's Play charity, and that was pretty damn awesome. "Nothing could have prepared us for this kind of support," the team said in the aftermath of the world's most tedious gaming marathon. This year's journey through the desert has raised over $240,000 - that's two hundred and forty THOUSAND dollars - and shows no sign of blowing a gasket anytime soon. Donations are still coming in, there's still lots of fantastic stuff to be auctioned and that means that the LRR team is likely going to have to man up for a few more days of awfulness! And if there's one thing I like better than doing a solid for the children, it's watching other people suffer for it. Speaking of which, here's a little something you can do to support the cause. To thank the LoadingReadyRun team for all the wonderful good it's doing, The Escapist is holding a charitable game of its own, with the "winning" member of LRR, as chosen by you, being slimed live and in color on Thursday! Because no good deed goes unpunished, am I right? Do your part to stick it to your favorite LRRist at The Escapist's Desert Bus for Hope page! I know you don't want to cause no fuss, so hop aboard the Desert Bus at desertbus.org - this is one ride you don't want to miss!